Your child's big teeth are in waiting in their gums below their milk teeth. By taking care of them, you can help their big teeth come through, healthy and strong. In fact, they can take up to 3 years to reach their full strength. As they start off, the enamel is 50% more vulnerable to sugar acid attack. 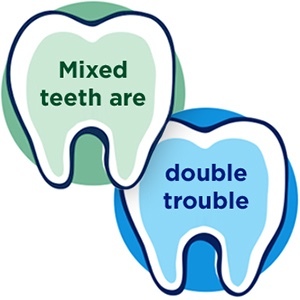 As well as vulnerable enamel, mixed teeth have awkward gaps and plaque traps. As well as vulnerable enamel, mixed teeth have awkward gaps and plaque traps. In fact, they can take up to 3 years to reach their full strength. As they start off, the enamel is 50% more vulnerable to sugar acid attack. What Macleans toothpaste should my child use? 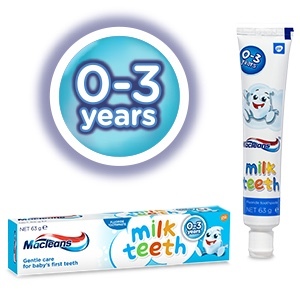 Macleans Milk Teeth toothpaste is specially designed for babies aged 0-3 who are showing signs of their first teeth emerging. 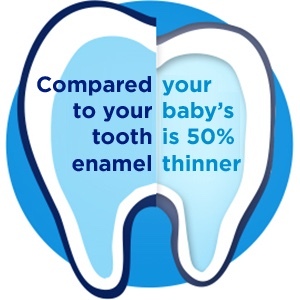 It's tough on decay and less abrasive than regular toothpastes, making it kind to baby's teeth. 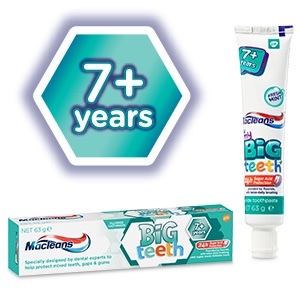 Macleans Big Teeth toothpaste is a gentle toothpaste made for children aged 7+ years. It has Sugar Acid Protection*, provided by fluoride, which helps strengthen enamel and protects not only their milk teeth from decay, but also their new adult teeth. *24 hr sugar acid protection provided by fluoride. Limit sugary snacks between meals and also brush twice daily with a fluoride toothpaste. 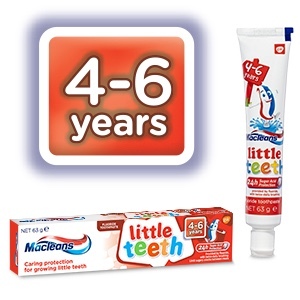 Macleans Little Teeth toothpaste is specially designed for children aged 4-6. It provides gentle care with low abrasion and the benefit of Sugar Acid Protection*, provided by fluoride. *24 hr sugar acid protection provided by fluoride. Limit sugary snacks between meals and also brush twice daily with a fluoride toothpaste. Wow! It's Captain Macleans and the Nurdles on your phone! 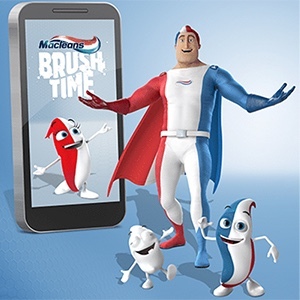 Together they will entertain your kids with catchy songs whilst showing them how to brush correctly. You can even use your own tunes! A timer counts down the recommended brushing time.And before they know it, they're done! 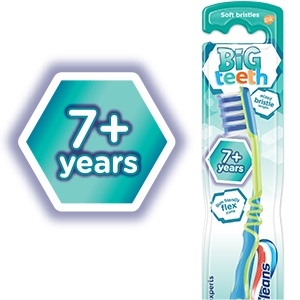 Macleans My Big Teeth 7+ Years Toothbrush is specially designed by dental experts. 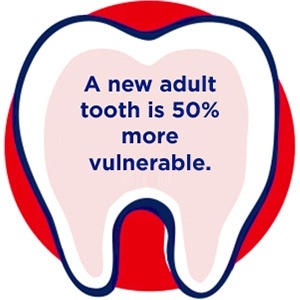 New adult teeth are not as strong as you think, their enamel is softer and more vulnerable to decay and the mix of little and big teeth makes them difficult to clean. 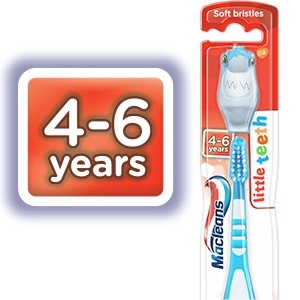 Macleans My Big Teeth 7+ Years Toothbrush is specially designed by dental experts for children 7+ years. It has a cool handle design and a mixed bristle head to help clean mixed teeth, gaps and gums whilst you encourage kids to brush for themselves. Dentists recommend that toothbrushes are changed every 3 months. 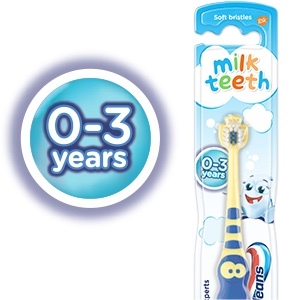 Macleans Big Teeth Kids Soft Toothbrush is rated 5.0 out of 5 by 3. Rated 5 out of 5 by Secret Reviewer from Good for older kids These are a great toothbrush for older kids who need a brush smaller than an adult size. Rated 5 out of 5 by Nann Han from It's time to change the tooth brush I bought this one as my kid asked for a new one, a different brand from what she usually uses. This Macleans is very soft, and completely suit my 7 year-old kid. She loves it and want to do toothbrushing more frequently.